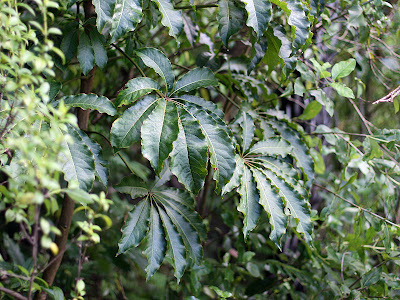 Pate Schefflera digitata, photographed by Kahuroa. The Araliaceae are a family of nearly 1500 species of flowering plants found around the world, but primarily in the Old World tropics. Most of its members are trees or shrubs, but there are also some herbaceous or climbing species. Many Araliaceae have palmate leaves, and they often produce inflorescences in umbels. Not that many Araliaceae hold much economic prominence: Tetrapanax papyriferus is used to make rice paper, while the genus Panax includes the ginsengs that are widely regarded as something of a wonder-drug for no apparent good reason. Some other species are well known as garden plants, such as ivy Hedera helix. Back in my home country of New Zealand, Araliaceae include some of the most familiar small native trees such as pate Schefflera digitata and the five-fingers and lancewoods of the genus Pseudopanax. 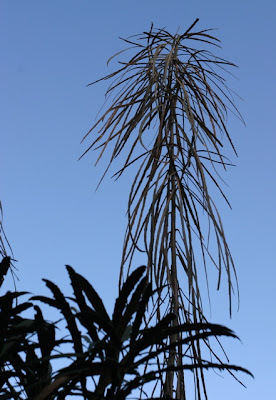 A young lancewood Pseudopanax crassifolius, photographed by Mike Hudson. Lancewood is notable for its differing growth habits over its lifespan: this individual is just beginning to change from its juvenile to its mature foliage. When the plant is young, the long, narrow, tooth-edged leaves hang down around the trunk. As the tree matures, it produces leaves that are shorter, broader and with less strong teeth, and that are held upwards and outwards. The juvenile and mature trees are so different in appearance that they were initially described as different species. The Araliaceae have long been recognised as close relatives of the Apiaceae, the family including carrots and celery, to the extent that some authors have combined the two in a single family. Most recent researchers have maintained the distinction, but phylogenetic studies have indicated that some genera previously treated within the Apiaceae, notably the water and marsh pennyworts of the genus Hydrocotyle, are better treated as basal Araliaceae (Plunkett et al. 1997). Relationships within the Araliaceae are somewhat less straightforward, as molecular phylogenetic studies have indicated that there has been a great deal of homoplasy in morphological characters (Plunkett et al. 2004). Some of the larger genera in the family (notably the genus Schefflera, to which nearly half the species of Araliaceae have been assigned) appear to be significantly polyphyletic, some of them not even resolving in particularly proximate clades. The difficult nature of many araliaceous genera has long been realised: in 1868, the botanist Berthold Seemann referred to the then-poorly defined Panax as "one of the great lumber rooms of our science" (Wen et al. 2001). 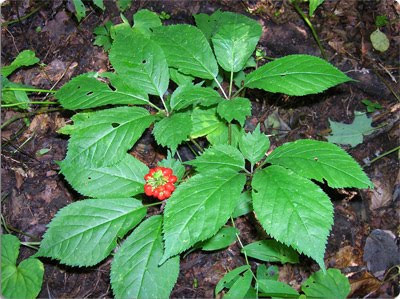 American ginseng Panax quinquefolius, from here. Red ginseng is derived from the root of this species and the Asian P. ginseng; however, over-harvesting has lead to the endangerment of wild populations of the latter. Plunkett, G. M., D. E. Soltis & P. S. Soltis. 1997. Clarification of the relationship between Apiaceae and Araliaceae based on matK and rbcL sequence data. American Journal of Botany 84 (4): 565-580. Plunkett, G. M., J. Wen & P. P. Lowry II. 2004. Infrafamilial classifications and characters in Araliaceae: Insights from the phylogenetic analysis of nuclear (ITS) and plastid (trnL-trnF) sequence data. Plant Systematics and Evolution 245 (1-2): 1-39. Wen, J., G. M. Plunkett, A. D. Mitchell & S. J. Wagstaff. 2001. The evolution of Araliaceae: a phylogenetic analysis based on ITS sequences of nuclear ribosomal DNA. Systematic Botany 26 (1): 144-167. I have always put the popularity of ginseng (and the Eleutherococcus version) down to the stimulant and psychoactive effects. In Traditional Chinese Medicine it is regarded as dangerous to combine ginseng with caffeine. I don't like ginseng but it is intriguing to see that one of my favourite herbs has moved in. Centella asiatica is wonderful for promoting fast healing for any injuries. It may be the reason Thai kick boxers don't die as often as they should.